There’s a happy triangle of culinary goodness to be found in this little corner of Dublin 4, at the junction of Bath Avenue, Shelbourne Road, and Grand Canal Street. Not so long ago, your options were limited to a choice of two chippers, or a feed of pints in Slattery’s pub. Then Junior’s arrived on the scene, which seems to be out the door every day and night of the week. Now we have Paulie’s Pizza, the Chop House, and Farmer Brown’s, all feeding the well-heeled locals and the Google Ghetto-dwellers, as well as The Bath Pub giving Slatt’s a run for its money on the pub front (they’ll also serve you a pizza during the week or brunch at the weekend). But it’s the smallest spot that has stolen my heart, and become my new local, since I moved to the area a few months ago. Foodgame is a tiny cafe on South Lotts Road that’s busy every weekend (and I hear they do a savage lunch during the week), but still feels like a well-kept secret to everyone except the loyal locals who frequent it. It started life a few years ago as part-foodstore, part cafe, but over time has morphed fully into a cafe/restaurant. I got addicted to the coffee first, when all of my weekend jogs or walks gradually started to end up there. Then I came back for the grub… and now I keep going back. Last Saturday morning, I’d sat down at a table just inside the door, papers in front of me as I waited for my coffee to arrive, when a little girl toddled in with her Dad. She looked around, big smile on her face, and clapped her hands. I knew just how she felt. Foodgame is somewhere that I’m perfectly happy to go on my own – in fact I kind of prefer to. The communal seating and counter areas in this small space lend themselves to spreading out the papers while you get stuck into your coffee and breakfast. I love the simplicity of the menu, which is the same few dishes written on a blackboard and rustled up in the tiny kitchen area. Bacon and eggs, mushrooms on toast, scrambled eggs on toast, omelettes, their homemade granola. Most things come served on their freshly baked brown bread, or toast if you prefer. There aren’t any fancy brunch dishes or “healthy options” on the weekend menu, but I like to think that these beautiful piles of the yellowest eggs and perfectly grilled rashers are clearly made with only the finest of produce, so they can only be good for you. Like my logic? You’re welcome. Although one exception to this rule may be their totally legendary mushrooms – this pile of buttery garlicky goodness on toast (or as a side with your eggs, if you ask nicely) is worth every single one of the bazillion calories it undoubtedly contains. I love the staff, who are always friendly, never over-familiar, and intuitively sympathetic to hangovers (not that I ever have one). Annoyingly, none of them look like they eat their own buttery mushrooms – maybe my “good for you” logic is actually true. I love the small selection of baked things on the counter (my sister & I fought over every last crumb of an orange & polenta cake on a recent visit), the scribbled design of the coffee cups, the clever blackboards outside (usually offering free coffee to whatever poor unfortunate has been in the news that week), and the two tiny tables outside that get the sun in the mornings. I love it so much, that I’m afraid that by writing about Foodgame I won’t get my favourite seat at the weekend any more (assuming people other than my mother are reading this blog). But I’m risking it, because I reckon they deserve it. 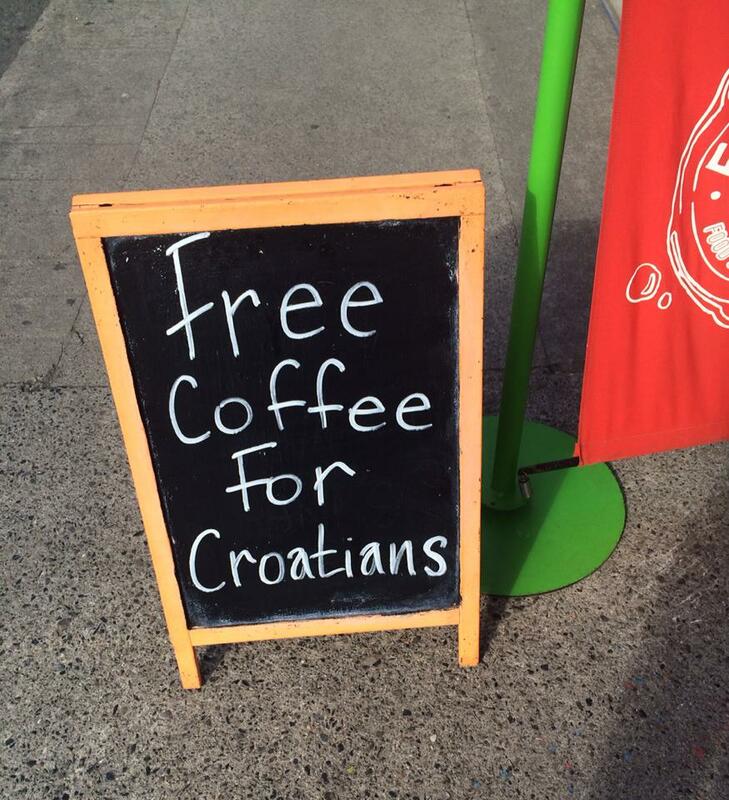 You need that coffee, and those mushrooms on toast, in your life. 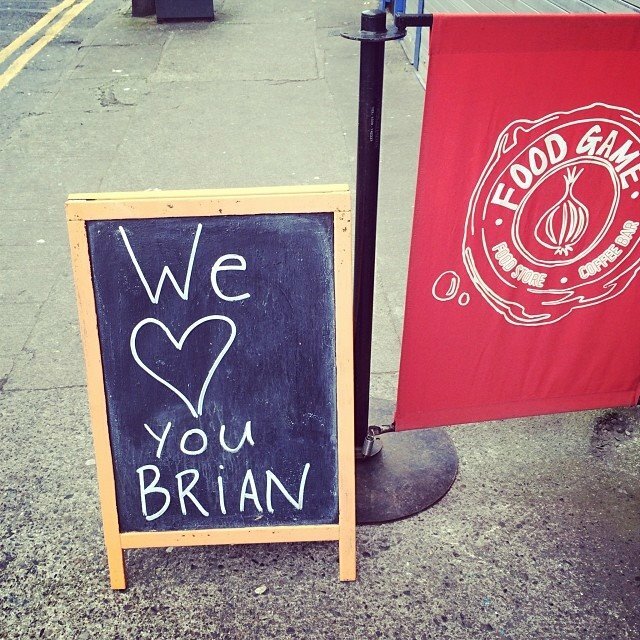 Foodgame, 10 South Lotts Road, Ringsend, Dublin 4. Visit their website or their excellent Facebook page for more info and pretty pictures. I know, I know, it’s been ages since I last posted, and I fear that my finger has slipped well and truly off the pulse. I know this, because it wasn’t me who found out about hot new pop-up restaurant, Salt Lick, even though it’s been on the go for a while and reviewed by much more active food bloggers than me. It took an invitation from my clearly much more clued-in friend Liza for me to go and try out this Friday & Saturday night-only eatery, which for 2 nights a week has been transforming the interior of Hobart’s cafe in the centre of Ranelagh. I loved the concept of a different theme every month – Liza had previously visited during “Taco month” and in June, it was “Tea and toast,” an intriguing theme which apparently involved “things on toast” washed down by Earl Grey martinis, if you don’t mind. But it was the winning combination of July being Japanese month, and the phrase “BYOC” that finally convinced me to pay Salt Lick a visit. What’s BYOC, you ask? 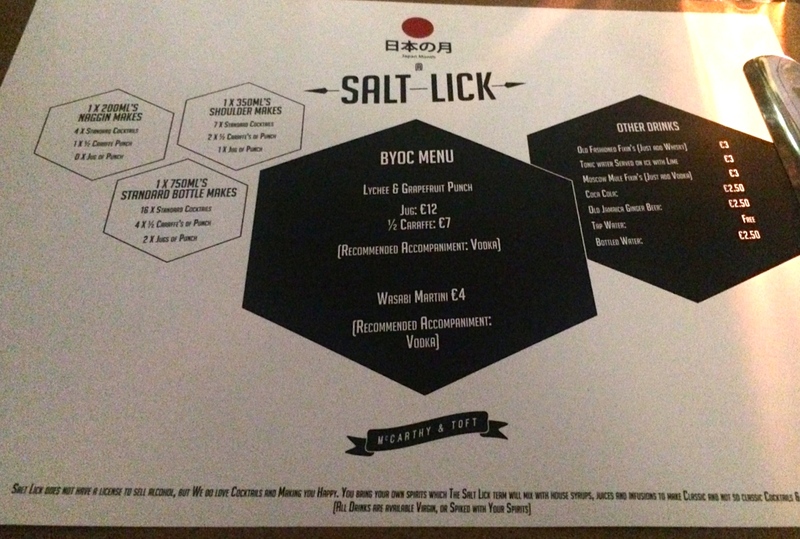 Well, in the absence of a booze licence, the clever chaps behind Salt Lick have gone one better on the recession-friendly BYO theme made popular by restaurants like Little Jerusalem and Musashi. Not content with showing off their creative cookery skills, they’ve also got a resident mixologist, so BYOC = Bring your own Cocktails. Oh yes. You bring the spirits, they make the cocktails and charge a small fee for the other ingredients. The cocktails also change with the monthly theme, and a quick check of Salt Lick’s Facebook page informed me that vodka was the spirit of choice for their Japanese-themed cocktails. Rocking up to a restaurant on a Friday night with a half-full bottle of vodka rooted out from the back of your drinks cupboard stashed in your handbag, only adds to the fun. When I arrived at 8pm, on time for once, the place was almost full and already buzzing. Hobart’s has been re-fitted with booths for all but one of the tables, which lends itself well to it moonlighting as a restaurant on weekends, and Salt Lick have added their own branding to the windows and tables. While I waited for Liza and Nicola to arrive, I decided to get the ball rolling with a drink and guiltily dug out my vodka bottle, handed it to the waitress and ordered a Wasabi Martini (€4). It was a risky choice for me, as my opinion on wasabi is best expressed by the definition I once heard from a long-forgotten source of “having your sinuses violated by a Dyno-Rod.” But hey, for €4 I decided I could afford the risk. The other cocktail option was a Lychee & Grapefruit punch, which you can have in a jug for €12, or a half-carafe for €7, and the drinks menu (see photo at the top) helpfully explains just how many cocktails your chosen quantity of BYO vodka will run to. They’ll also mix you up a whiskey-based cocktail or a Moscow Mule, or you can bring wine or beer if the cocktails aren’t your thing. If anything, the first one tasted a bit too sweet and with too little of wasabi, but on our second round we requested less sugar, and with a bit more bite they were so drinkable, we never got to try the punch at all. Wasabi Martini. Not a Dyno-Rod in sight. The set menu is €25 for two courses, or €30 for three, and ordering offers no decision-making dilemmas, as there are only two options per course – vegetarian and non-veggie, with both being variations on the same. We ordered one veggie starter option and two standard starters so that we’d get to sample everything. 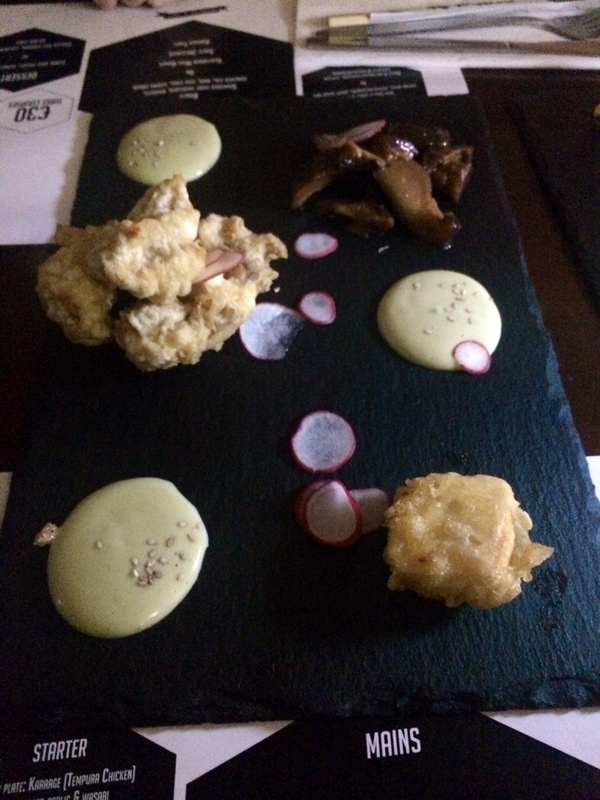 The Vegetarian Starter Plate consisted of garlic & soy grilled aubergine, tempura courgette & pickled mushroom, and the “Izakaya plate” of Tempura chicken, pickled mushrooms & crispy silken tofu, came with with a smoked garlic & wasabi dipping sauce. Izakaya Plate: Tempura Chicken, pickled mushrooms, crispy silken tofu (bottom right). The presentation was superb, although the food was a little hard to see in the dark surroundings (atmosphere, yeah?) and the tempura batter was crisp perfection. It was actually the veggie starter that won over for me – the courgette tempura and grilled aubergine on the vegetarian plate were amazing. There was something about the tempura chicken that was a little too “chicken nugget” for me, but the silken tofu was melt-in-the-mouth and the pickled mushrooms that featured on both starter dishes could single-handedly earn fungus a place on any Michelin-star menu. 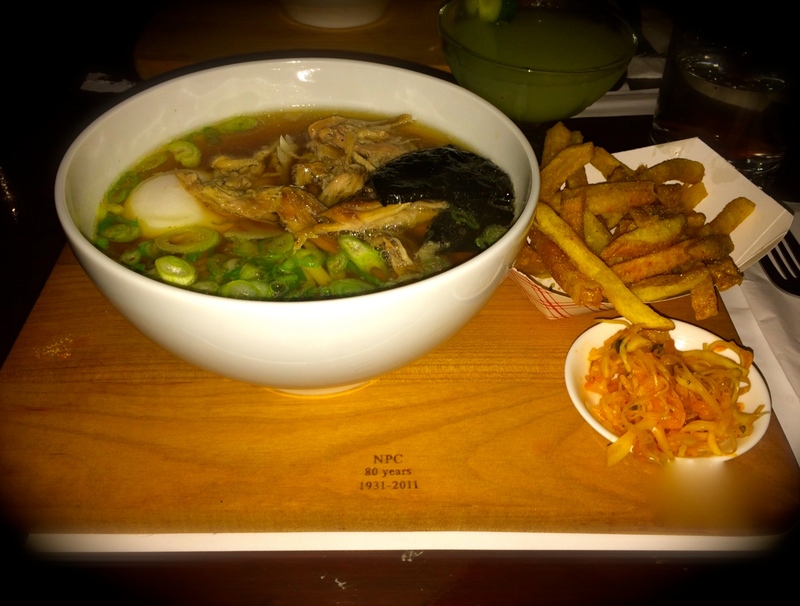 Pork Ramen with kimchi and Karashi fries. We ordered one dessert in the interest of sampling, a Lemon Posset with sake, served with homemade Peanut Brittle. It was a huge portion, plenty for all three of us to have a piece of brittle each, which we dipped into the very runny posset. Almost completely liquid in texture, we guessed this was possibly due to the sake causing it not to set fully. But sweet, delicious, and probably totally unnecessary it was in any case. The place was full all night, with great tunes played throughout and no pressure from the very friendly staff to move along so that they could squeeze in more sittings. Sure, where would you want to be going on a rainy Friday night, when you can drink €4 cocktails and chair-dance to Hall & Oates at your table? Once we’d finished our drinks and decided on where the next stage of our Friday night would take us, we asked for the bill and got a bit of a shock when it arrived. Yes, it’s technically cheap and cheerful at €30 a head for amazingly creative food and BYO, but a word of warning – if you insist on ordering thirteen wasabi martinis, this *may* bump up your bill ever so slightly. Although, given those thirteen martinis had been stretched out of one half-litre of vodka, we reckoned we’d done pretty well. So, get your skates on if you fancy Turning Japanese before the menu changes again – only two weekends left in July. 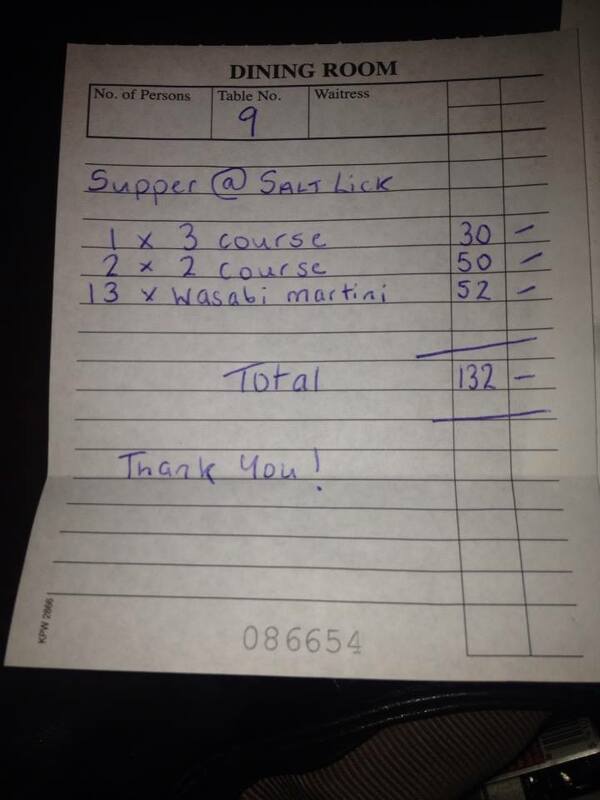 Salt Lick don’t have a website, but they have a pretty slick Tumblr and a Facebook page, and you can call (085) 102 7273 to book a table. I can’t wait to see what these guys come up with for August. 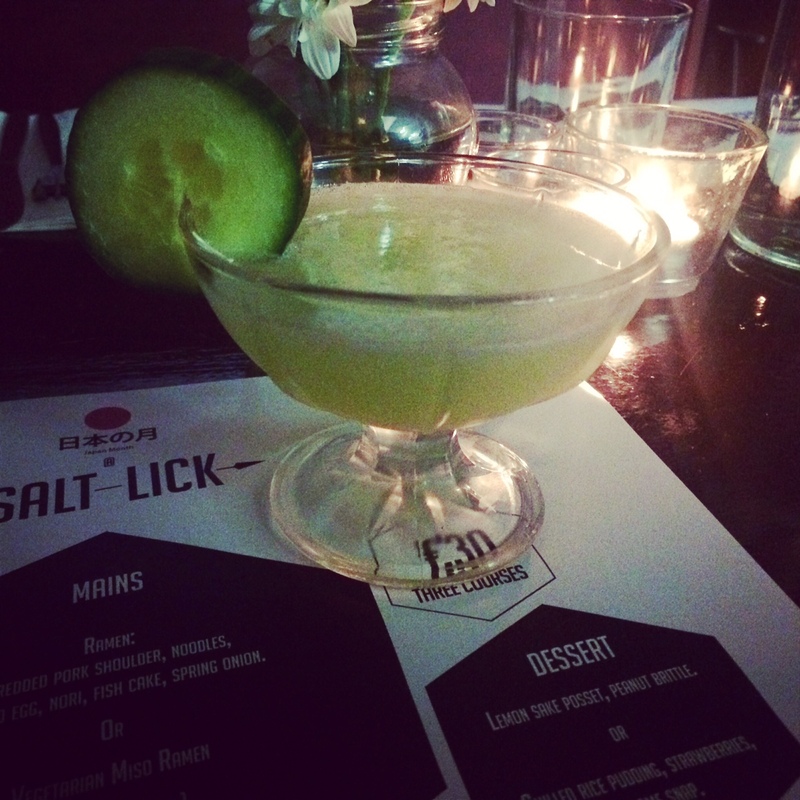 Salt Lick (in Hobart’s), Ranelagh, Dublin 6.